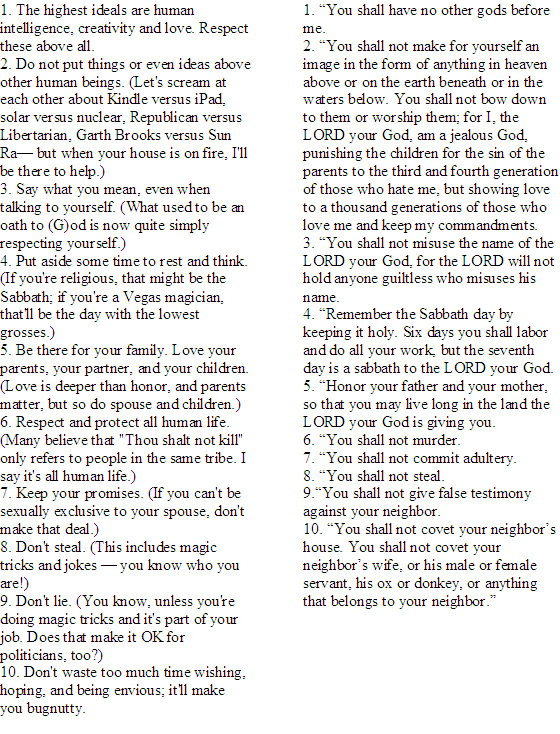 On January 21, 2010, magician and showman celebrity Penn Jillette tweeted: "Glenn Beck asked me to write "The Atheist Ten Commandments." He's not the boss of me, but I decided to do it anyway. It's pretty fun." It goes without saying that Penn is a serious atheist, libertine, liberal, and opposed to God and the idea of God. 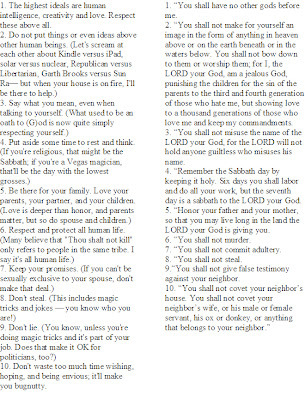 I have no idea of the backstory concerning the challenge from Beck to write an Atheists' Ten Commandments, other than the mention that there was a challenge and I've looked. I only found the tweet. But Penn did write a book on it and it's out. The book is called "God NO!" The moral standards for atheists that Penn thinks people should live by are on the left, which are suspiciously similar to, you know, God's? His are on the right. Click the image to go larger. They are similar to but differ in one important way. Penn, and all of unsaved man, believe that the highest ideal is a good person is his intelligence and creativity. That we can achieve goodness on our own if we follow these rules ... or work harder ... or live in a world without the negative influence of religion ... or follow certain steps ... or speak certain mantras ... Alas, none of these are true and none will succeed. The failure of atheists is to understand what Christians know: we are rotten. We are no good. There is no good in us, not one of us does good. (Romans 3:12, Psalm 53:3). We are full of deceitful desires (Ephesians 4:22). We are bad trees bearing bad fruit. (Matthew 7:17). You may balk, and say, "I do good! I give to the homeless and I volunteer in a hospital and I mentor an at-risk young boy!" Those are good things to be sure. But we are not looking at what is good based on a barometer like Penn's that goes no higher that the most intelligent person. Comparing goodness of one person to another may certainly get you Goodness points on Penn's scale. But who is Penn? Goodness is compared against the Holiness of God. Compared to THAT, none of us even come close. It is like a gnat saying they are stronger, smarter, better than a Mack Truck. It is like a drop of water challenging the Tsunami. And even those are puny analogies. God's holiness is so bright and strong that if any man were to see it he would explode on the spot. (Ex 33:20). Every man who saw the glory of God unveiled - even a split second of it - fell on His face and wished he were dead, or fell down as he were dead, because he knew his sin was filthy compared to God's holiness (Isaiah 5:21, Rev 1:17, Luke 5:8, Dan 10:5-9, Mark 4:41). If they didn't fall down they became terrified. And Penn, and atheists in general, elevate man's intelligence to higher than a glory so great men can't absorb it for a nanosecond? In Penn's wrongful elevation of man to the top of the heap, he places man's intelligence as the star on the Christmas tree. Thinking that there is no higher intelligence than man's is foolish. "Do not deceive yourselves. If any one of you thinks he is wise by the standards of this age, he should become a "fool" so that he may become wise.' (1 Corinthians 3:18). "Woe to those who are wise in their own eyes and clever in their own sight." (Isaiah 5:21). Here is the bottom line: we cannot be good but God is good. The reason we can't be good is that we are sinners. We're born that way. We're born to sin. It is why we can't know God, literally and figuratively. Man is SO craven that his blinded mind simply can't even conceive of Godliness. It is literally not in his nature to think that way. So God draws us to Him. When we refuse Him, as Penn has ("God, NO!") it is after wrestling with the conviction of the Holy Spirit, a hard-won, blatant refusal despite the grip the Spirit has on us all to draw us from sin toward forgiveness and then glory. This rejection has eternal consequences. God first says 'OK'. He then gives the person over to his desires, his degrading passions, and his sin. When that person dies, he has his wish granted to be separate from God forever, finally. He goes to hell, where God is not. Penn's moral rules are good. But without God in them, authoring them, molding us to them, they are only ashes in the mouth of a dying man. Yawn...I mean seriously YAWN YAWN YAWN. Atheists are are bold now (and sound like very broken records). In a way, they are even more self righteous than they claim christians to be. So much pride, so much pride...yet God still loves every single one of them and wants none to perish. He knew all this and still came on this wretched earth and sacrificed everthing for His own messed up creation. I pray for atheists/agnostics almost everyday and it always makes me remember God's love for them. The days are coming where not a single atheist wlll be left on earth. I know many will perish but I thank God that we read in the Book of Revelations of a massive, massive multitude of tribulation saints. The multitude will be made up of former Muslims, People who hated God and Israel, wiccans, rapists, atheists, agnostics, witches, Buddhists, God scoffers..etc and the moment each of them cry out to God HE WILL SAVE THEM just like He saved us. I worship you Lord for no matter what, you never change. You are forever merciful, forever just, forever worthy of all praise and Glory. Amen! I know this is off topic, but I think you might want to see it. More proof that aliens are demons, to those of us who can read between the lines. My husband loves Penn and Teller's magic act (to be fair, yes, it has awesome illusions), but I have a hard time watching them because of things I've heard this man say, or things I've read of his. Ya know, like this bit this post is about... Sigh.